The sister of Elsa, and one of the new Princesses of Heart. As a child, she and Elsa would play in the snow that Elsa could create out of thin air. One day, Anna was injured by an ice blast which struck her heart and the King and Queen took Anna to the Rock Trolls for some magic to save her. The Trolls removed her memory of the incident, as well as the memory of Elsa having powers, and Anna grew up not knowing that her sister was hiding her true self. 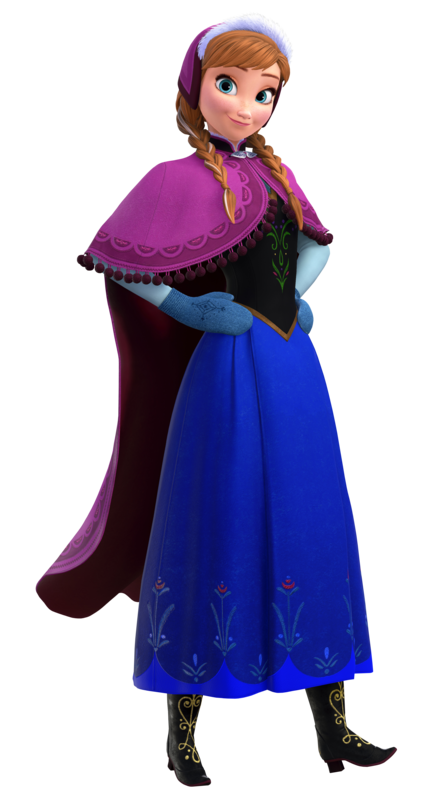 At Elsa's coronation to become Queen, her ice powers are revealed to all of Arendelle and Elsa flees the village. Casting an eternal winter over Arendelle, Anna sets off to find her sister and undo the winter curse. Along the way, she meets Kristoff, an ice harvester, and his reindeer Sven, and they team up to go get Elsa. When they reach a frozen lake, Anna and Kristoff encounter Olaf, the snowman Elsa brought to life during her escape from Arendelle. It is also here where she meets Sora, Donald, and Goofy.